, afterwards earl of Totness (descended from an ancient family in the West of England, originally so named from Carew-castle in Pembrokeshire) was born in 1557. His mother was Anne, daughter of sir Nicolas Harvey, kiTight, and his father, George, archdeacon of Totness, and successively dean of Bristol, of the queen’s chapel, of Windsor, of Christ Church, Oxon, and of Exeter; besides several other preferments, most of which he resigned before his decease, which occurred in 1585. 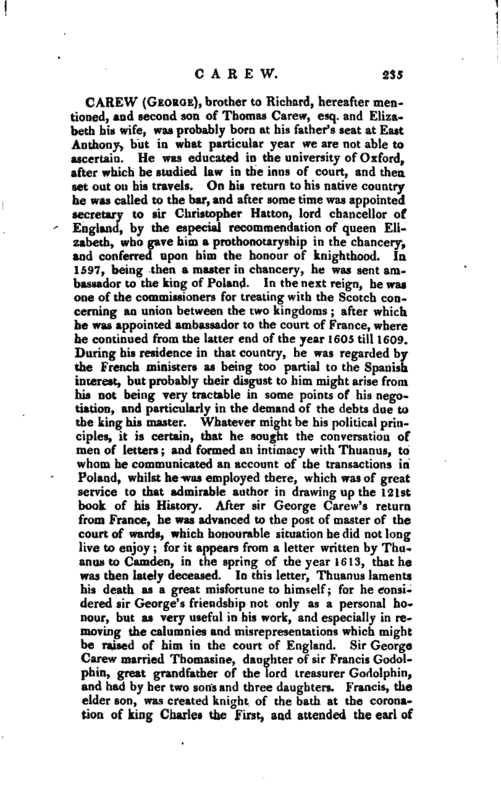 George Carew in 1572 was admitted gentleman commoner of Broadgate-hall (now Pembroke college) in Oxford; where he made a good proficiency in learning, particularly in the study of antiquitie’s, but being of an active temper, he left the university without a degree; and applying himself to military affairs, went and served in Ireland against the earl of Desmond. In 1580 he was made governor of Asketten-castle, and in 1589 was created master of arts at Oxford, being then a knight. Some time after, being constituted lieutenant-general of the artillery, or master of the ordnance in Ireland, he was one of the commanders at the expedition to Cadiz, in 1596; and again, the next year, in the intended expedition against Spain. Having in 1599 been appointed president of Munster, he was in 1600 made treasurer of the army, and one of the lords justices of Ireland. 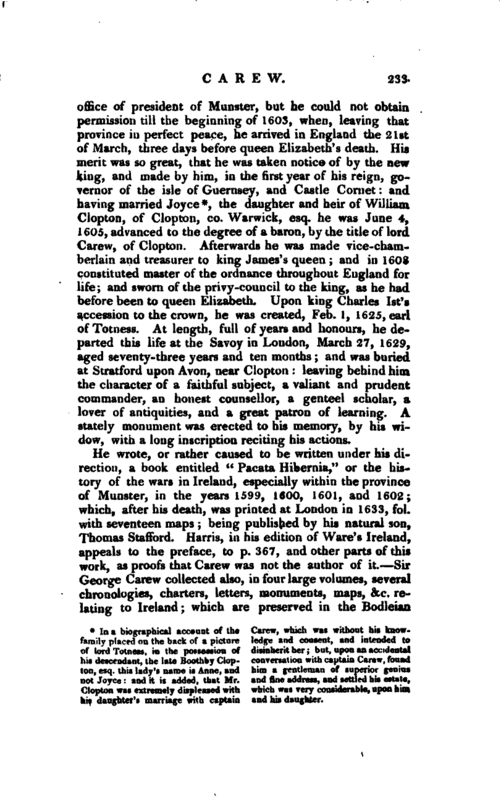 When he entered upon his government, he found every thing in a deplorable condition; all the country being in open and actual rebellion, excepting a few of the better sort, and himself having for his defence but three thousand foot and two hundred and fifty horse; yet he behaved with so much conduct and bravery, that he reduced many castles and forts, took James Fitz Thomas, the titular earl of Desmond, and O’Connor, prisoners; and brought the Bourkes, Obriens, and many other Irish rebels, to submission. He also bravely resisted the six thousand Spaniards, who landed at Kinsale, October 1, 1601, and had so well established the province of which he was president, by apprehending the chief of those he mistrusted, and taking pledges of the rest, that no person of consideration joined the Spaniards. In 1602 he made himself master of the castle of Donboy, which was a very difficult undertaking, and reckoned almost impracticable; and by this means prevented the arrival of an army of Spaniards, which were ready to sail for Ireland. He had for some time been desirous of quitting his burdensome | office of president of Minister, but he could not obtain permission till the beginning of 1603, when, leaving that province in perfect peace, he arrived in England the 21st of March, three days before queen Elizabeth’s death. His merit was so great, that he was taken notice of by the nevr king, and made by him, in the first year of his reign, governor of the isle of Guernsey, and Castle Cornet: and having married Joyce*, the daughter and heir of William Clopton, of Clopton, co. Warwick, esq. he was June 4, J 605, advanced to the degree of a baron, by the title of lord Carew, of Clopton. Afterwards he was made vice-chamberlain and treasurer to king James’s queen; and in 1608 constituted master of the ordnance throughout England for life; and sworn of the privy-council to the king, as he had before been to queen Elizabeth. Upon king Charles Ist’s accession to the crown, he was created, Feb. 1, 1625, earl of Totness. At length, full of years and honours, he departed this life at the Savoy in London, March 27, 1629, aged seventy- three years and ten months and was buried at Stratford upon Avon, near Clopton leaving behind him the character of a faahful subject, a valiant and prudent commander, an honest counsellor, a genteel scholar, a lover of antiquities, and a great patron of learning. A stately monument was erected to his memory, by his widow, with a long inscription reciting his actions. 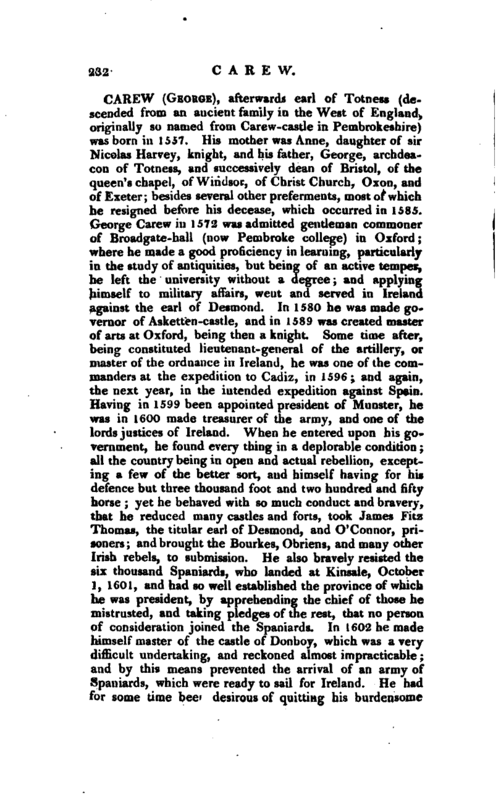 * In a biographical account of the Carew, which was without his knowfamily placed on the back of a picture ledge and consent, and intended to of lord Totness, in the possession of disinherit her but, upon an accidental his descendant, the late Boothby Clop- conversation with captain Carew, found ton, esq. this lady’s name is Anne, and him a gentleman of superior genius not Joyce: and it is added, that Mr. and fine address, *nd settled his estate, Clopton was extremely displeased with which was very considerable, upon him his daughter’s marriage with captain and his dmjghter. | library: and made collections, notes, and extracts for writing The History of the reign of king Henry V. which were inserted in J. Speed’s Chronicle. Sir James Ware says, that the earl of Totness translated into English “A History of the affairs of Ireland,” written by Maurice Regan, servant and interpreter to Dermot, son of Murchard king of Leinster, in 1171, and which had been turned into French verse by a friend of Regan. Bishop Nicolson describes this history as extant in the duke of Chandos’s library, under the title of “Mauritii Regani, servi et interpretis Dermitii, filii Murchardi, &c. Historian de Hibernia fragmentum Anglice redditum a D. Georgio Carew, Memoniae preside sub Elizabetha;” and Mr. Harris mentions another ms copy among the bishop of Clogher’s Mss. in the college library, Dublin. 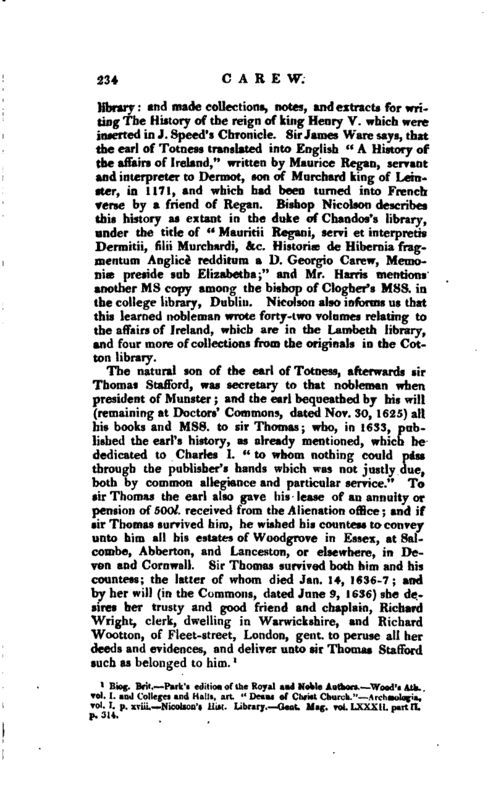 Nicolson also informs us that this learned nobleman wrote forty-two volumes relating to the affairs of Ireland, which are in the Lambeth library, and four more of collections from the originals in the Cotton library. Biog. Brit. Park’s edition of the Royal and Noble Authors. Wood’s A th. To!. I. and Colleges and Halls, art “Deans of Christ Clmrch.” Ardixolo^in, vol.1, p. xviii. Nicolsoo’s Hist. Library. —Gent. Mag. vol. Lxxxh. part If. p. 314.